The Congressional Black Caucus is heading to Silicon Valley. Caucus Chairman G.K. Butterfield (D-N.C.) and two other members are slated to travel to California in early August to pressure tech leaders to put more of a focus on African-American recruitment. WASHINGTON, D.C. – In the midst of growing bipartisan recognition that America must confront our overcriminalization problem, a group of Democratic and Republican members of Congress have launched an effort to comprehensively address public safety and our broken criminal justice system. 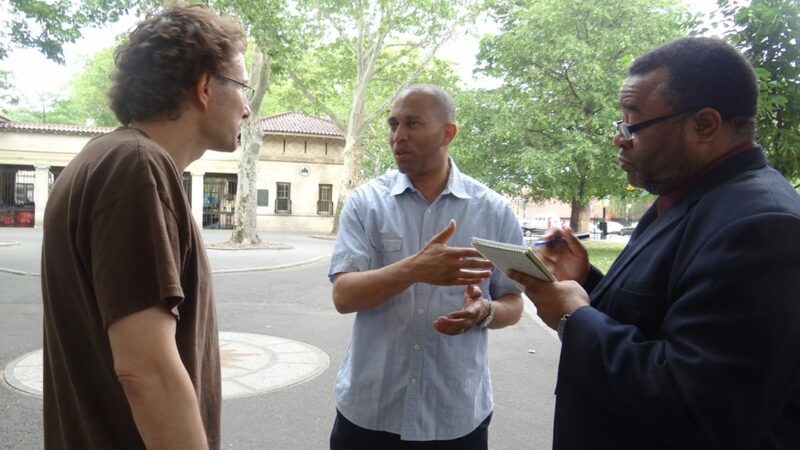 Brooklyn Congressman Hakeem Jeffries announced today that he and three peers—two Republicans and one fellow Democrat—will co-chair a new Criminal Justice and Public Safety Caucus, aimed at altering the prison system in the United States. WASHINGTON, D.C. – Last night, the House of Representatives unanimously passed on a voice vote an amendment sponsored by U.S. Representative Hakeem Jeffries (NY-08) that will prohibit the allocation of federal funds in connection with the purchase or display of a confederate flag on a public building or facility under the authority of the National Park Service. "New York City is a hotbed of innovation. Some of the world's most important tech firms are based here. Uber is a key part of that community. In a press conference, Rep. Jeffries (NY-08) explains how overcriminalization negatively affects minority communities. Rep. Hakeem Jeffries (NY-08) speaks with NY1 to explain action he is taking to protect public housing residents in New York. He introduced a new bill in July called P.J. 's Act. This bill commits public funding to the installation of surveillance cameras in public housing buildings to promote safety for the buildings' residents. Rep. Jeffries criticizes House GOP members' push to sue President Obama over his use of Executive Action. Rev. Al Sharpton talks to Rep. Hakeem Jeffries about the push to raise the minimum wage and help raise many Americans out of poverty. Rep. Hakeem Jeffries explains why $3M in Sandy repair aid for Coney Island's pier remains unspent.The federal government earmarked $3 million in disaster relief funds for the pier's repair, according to Rep. Hakeem Jeffries, but officials have not been able to find a contractor to make all the necessary repairs for that price. Congressman Hakeem Jeffries (NY-8) joined Errol Louis on NY1's Inside City Hall to discuss the political gridlock in Washington, immigration reform and more. Rep. Hakeem Jeffries (D-NY) called Speaker Boehner’s proposed lawsuit against President Obama over his use of executive orders a “political gimmick,” drawing comparisons between the Bush and Obama Administrations’ use of executive authority. On MSNBC's "Ronan Farrow Daily," Rep. Hakeem Jeffries (NY-08) discusses Congressional response to the ongoing humanitarian crisis at the southern U.S. border and his legislation, the Vulnerable Immigrant Voice Act of 2014 (VIVA) which would provide legal counsel for unaccompanied minors and disabled individuals in detention proceedings. On MSNBC's "All In with Chris Hayes," Rep Hakeem Jeffries (NY-08) discussed the flood of unaccompanied minors at the border and his bill, the Vulnerable Immigrant Voice Act of 2014. The legislation would provide counsel for unaccompanied minors and mentally disabled individuals in detention proceedings. Rep. Jeffries on MSNBC: "The Secret Service needs a dramatic restructuring from top to bottom"